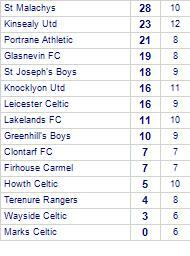 St Malachys take all points from Leicester Celtic. 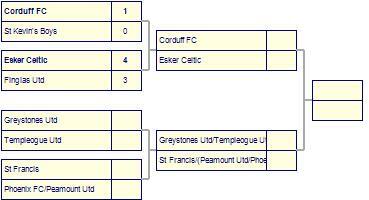 St Malachys has yet to be beaten in this competition, having won 5 out of its last 6 games. 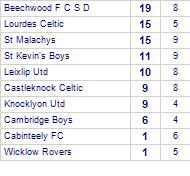 St Malachys are defeated by Liffey Valley Rangers. 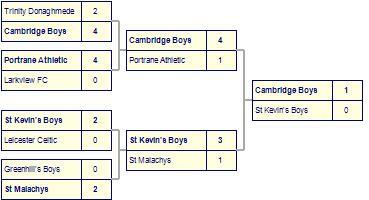 St Malachys has yet to win in this competition, having lost all 3 games. 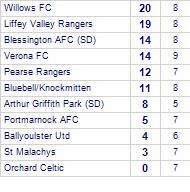 Liffey Valley Rangers are currently on a winning streak of 4 games. Shelbourne Academy beat St Malachys. 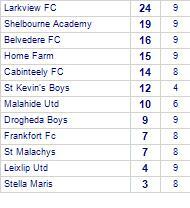 St Malachys have yet to win away from home. Wicklow Rovers are defeated by St Malachys. 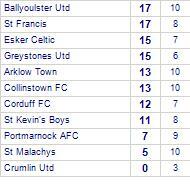 Wicklow Rovers has yet to win in this competition, having lost all 4 games. Peamount Utd despatch St Malachys.